Dextrose Injection, USP has value as a source of water and calories and is capable of inducing diuresis depending on the clinical condition of the patient. Dextrose Injections USP are sterile, nonpyrogenic and contain no bacteriostatic or antimicrobial agents. These products are intended for intravenous administration. These intravenous solutions are indicated for use in adults and pediatric patients as sources of calories and water for hydration. Dosage of dextrose injection is dependent upon the age, weight, and clinical condition of the patient as well as laboratory determinations. Weifang Shengtai supplied Kelun Pharmaceutical which has grown into a pharmaceutical group with 16 subsidiaries with 10 thousand tons of dextrose monohydrate injection grade. Goldstein Research analyst forecast the dextrose injection market size is set to register the growing CAGR of 5.2% over the forecast years. Availability in variety of dosage forms and demand of dextrose injection to treat nutritional deficiencies are the key drivers of the dextrose injection market. The report covers the present ground scenario and the future growth prospects of the dextrose injection market for 2017-2025 along with the data of end user medical facilities worldwide. We calculated the market size and revenue share on the basis of revenue generated from major players across the globe. 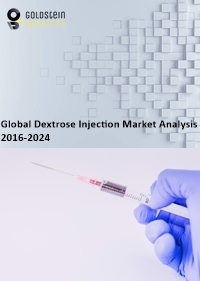 The Dextrose injection Market is forecasted on the basis of revenue analysis, product benchmarking and strategic developments of key market players. The report also includes micro and macro factors essential for the existing market players and new entrants along with detailed value chain analysis. Based on product type, 5% dextrose injection held the largest share valued 42% in the global dextrose injection market owing to the increasing usage in clinical pharmacology where dextrose and sodium chloride injection, USP has value as a source of water, electrolytes, and calories and is capable of inducing diuresis depending on the clinical condition of the patient while 10% dextrose is growing at the substantial rate owing to fastest scene times and the fastest recovery times in brain damage conditions. Global Dextrose injection Market Outlook 2017-2025, has been prepared based on an in-depth market analysis from industry experts. The report covers the competitive landscape and current position of major players in the global Dextrose injection Market. The report also includes porter’s five force model, SWOT analysis, company profiling, business strategies of market players and their business models. Global Dextrose injection Market report also recognizes value chain analysis to understand the cost differentiation to provide competitive advantage to the existing and new entry players. Our global Dextrose injection Market report comprises of the following companies as the key players: Pfizer, Amphastar, ChanGee, HAIXIN, Seqirus, Baxter, Shandong Qidu Pharmaceutical, Sanctus Drugs & Pharmaceuticals Pvt, Mountainside Medical, Shaanxi Torch Biotechnology, Hospira, B Braun. According to the report, major driving factor is the increasing cases of hypoglycemia condition characterized by an abnormally low level of blood sugar and is commonly associated with the treatment of diabetes. Emergency Department (ED) visit rates for hypoglycemia were highest among adults with diabetes aged 75 years or older, almost 3 times as high as the group aged 45–64 years with the lowest rates. Further, the report states the biggest challenge is the risk of air embolism and hypersensitivity/infusion reaction including anaphylactic/anaphylactoid reactions that have been reported with 5% dextrose injection and 10% dextrose injection. Based on geography, APAC held the dominant position in global dextrose injection market with the market share of 40% in 2017 owing to presence of leading producer like Weifang Shengtai of pharmaceutical injection-grade glucose in China, which has about 40% of the market and is one of the only 3 licensed manufacturers in China of injection grade dextrose monohydrate. North America is the emerging market followed by Europe owing to the demand of dextrose injection to treat the conditions like replenishment of lost fluids and carbohydrates.